Gallerist Barry Whistler lined a corner of his booth at the Dallas Art Fair with a plush rug. He expects visitors will appreciate a cushioned retreat from the concrete floors of the Fashion Industry Gallery after a long day scouring nearly 100 exhibitors. It doesn’t hurt that a little padding encourages extra face time with the art by John Pomara, Jay Shinn and Andrea Rosenberg. By 11 a.m. Thursday, Whistler had already sold a large work. Dallas Art Fair week has officially begun! In nine years, the size of the fair has substantially grown from its original 35 participants. This year FIG’s meandering hallways overflow with work that’s especially noteworthy. From the 30 new additions including the big hitters Gagosian Gallery, Skarstedt Gallery, and Lehmann Maupin to local staples like Ro2 Art and William Campbell Contemporary, the fair is packed with art worth a second glance or a checkbook ledger entry. 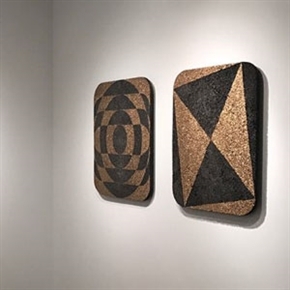 In its second year at the fair, Erin Cluley Gallery puts forth an impressive showing of her impressive roster including Dallas-based artists Kevin Todora and Francisco Moreno. In an interesting move, Gagosian dedicates its space to the conceptual artist Piero Golia’s Chalet, familiar to Dallas audiences from an iteration of the project that inhabited the Nasher Sculpture Center in 2015. The booth, which sits in one of the prime spots just off the foyer, is more engaged with immersion in the art, or conversation with “the listener,” than commerce. It’s one of the few reminders in an otherwise sales-oriented event to pause and enjoy the art. Those moments of artistic respite are important during this week’s hectic trip through the city’s museums, galleries, and seemingly endless array of parties, concerts, and receptions. From Friday night’s openings at the Dallas Contemporary to the panel on collecting at the Nasher Sculpture Center to the “alternative” art fair hosted by the Texas Women’s Caucus for Art in Fair Park, this week is go-go-go for the Dallas art world and the numerous visiting gallerists, artists, and collectors. If your legs grow stiff or you need a shot of caffeine, you can find Barry Whistler’s rug just a few stumbles away from the pop-up Weekend Coffee shop on the second floor.